These Correspondence Files include quite a lot of photos of owner’s machines, in a wide range of conditions, from As Found to Fully Restored. Among them, I was bemused to identify several with transposed cylinder heads, one with transposed cylinders, and even one with two LH heads! Because of the partial symmetry of each cylinder head, and the similarity of its ports, it is possible to switch left- and right-hand heads with each other so that the (identical) port-faces connect up perfectly with the inlet and exhaust manifolds. However, the head fins will be at 12⁰ to the vertical, and the sparking plugs will be to the rear! Also, Jarvis or Inglis rockers will be required, as they pick up on four of the head-to-cylinder bolts, but not , as such, on the heads. Additionally, the functions of inlet and exhaust ports will have been exchanged. Because of the approx. 6⁰ offset of the ring of six holes at the top of each cylinder (in opposite directions! ), the switching of cylinders left for right is not on, if proper manifold alignment is to be achieved. It follows that the pushrods would have to work at fairly wild angles, too. On a more serious note, a LH cylinder could be converted to a RH component (or vice versa) by turning the cylinder through 90⁰ and drilling and tapping a fresh set of dia. ¼” BSF holes. These would fall sufficiently far from the existing holes (at intervals of 18⁰ and 42⁰) as not to affect them. (Without the 90⁰ turn, the intervals would be 12⁰ and 48⁰). Both the Inglis and Jarvis Instruction books, page 17, under the heading "To Adjust the Bevel Drive", advise that "A small locking plate will be found immediately below (the Chain Guard). REMOVE THIS" (The capitals are mine). But then, no instruction is given to REFIT IT. Can this be significant? The Correspondence Files throw up only one reference, from Albert Wallis, 6 Mar. 1980, who wrote "When I stripped the engine out of the frame, this little bit dropped on the bench, try as I may I can-not see where it goes". He added a small but unmistakeable sketch of the plate, and also The Photo that was featured. In spite of Les Taverner in his series of ABC Restoration articles of long ago making up a locking plate that he attached to a non-original bolt in the top of his bevel box, it is surely clear that a real locking plate should be anchored by one of the dia. 3/8" bevel box through-bolts: but do we have an expert who can say authoritatively if it should be the upper or the lower bolt? Martyn Round has supplied not so much a Technical Tip but a Technical Caveat, concerning Sopwith cylinder heads. He says that he has come across distinct variations in the angles at which the exhaust and inlet-port faces have been machined. So if you are thinking of treating your pride and joy with a fresh set of heads, it could avoid late surprises if you compare new with old angles first. I dimly recall reading, long ago, that one of the things that should be checked during periodic main-tenance of Sopwiths, is the tightness of the rivets holding the bevelled pinion to the output shaft in the bevelbox! (How on earth one is meant to do this as part of ‘periodic maintenance’ is beyond me) By chance, I mentioned this to Laurie Woodage, who was going to open his bevelbox anyway: and he found that his rivets were indeed loose! This is not intended to worry anyone: it’s only to say that Laurie has a stock of dia. ¼” rivets and a modified rivet snap tool, that he’d be happy to lend to any members-in-need. Some of you may have noticed an advert in the pages of recent VMCC Journals for a publication, "From Somme to Beverley by way of Sunderland". It's all about "The ABC engine in military service 1915 to 1971", and is privately published by Kim Siddorn of Bristol. With soft covers in A5 format, its 67 pages include a lot of high-quality black and white photos, most of which I'd not seen before, covering ABC's range of stationary engines. These were used in many roles, from WWI trench-pumps to airborne APUs. Although the text rambles a bit, and some of the 'facts' are rather loose, I think it represents excellent value at £5, inc. P&P. Just send a cheque for a fiver to Kim at 9 Durleigh Close, Bristol BS13.7NQ. (If you are anxious for a quick delivery, a self-addressed envelope would probably help). Additions to 'the library': There are two adverts from The Motor Cycle of November 1919, showing a Sopwith in Show condition. Of more general interest, however, is a leaflet concerning the working of some Claudel-Hobson carburettors. Model H.C. 6 was recommended for Motor-Cycles, but curiously, Model H.C. 4, our type, was intended for Light Cars and Cyclecars! A spare jet was listed at 4/6d. My piece aimed at increasing awareness of our ABC Association has now appeared in the February issue of the VMCC Journal, and already there's been a reaction! From a fellow advising me of the Bob Thomas collection of ABCs on the IoM. In fact I'm already in cahoots with one of the Collection officials, to see if some part of the considerable cache of spares can be liberated…watch this space! The sad news was received in mid-January of the death of member Laurie Woodage, after a long illness. In spite of this, he was present at the Founders Day outing in July of last year, and was game enough to help push-start my bike for its run round the arena. This news came in after the above reference to Laurie was made. I have decided to let it stand, as a reminder of Laurie's positive and helpful character. 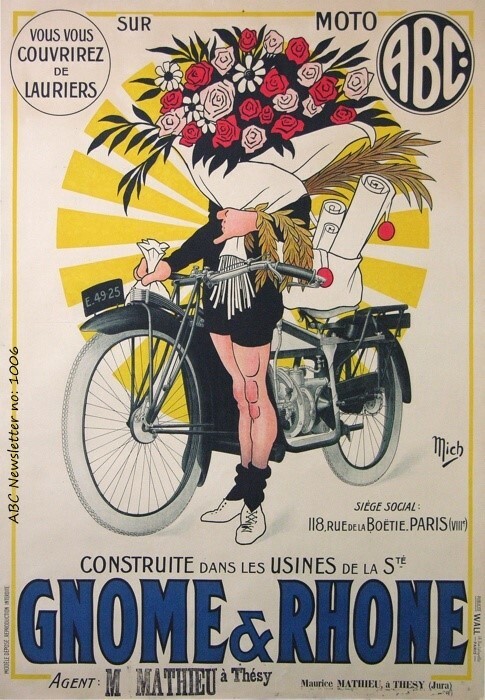 This unusual but rather charming poster comes from a good friend who lives in central France. As far as I can translate it, the legend suggests that you will find yourself bedecked with laurel-roses, once aboard a Moto ABC! Manufactured in the factories of Gnome et Rhone, in this instance. Circulation of this Newsletter is 20. The updated Membership List now stands at 13, and is included to those of you who appear on it.